CHINA VOWED TO EAT LESS MEAT but did they manage it? In 2016 (the year that I started Molly Musgrave Foods to make products using less meat) the Chinese government announced their new dietary guidelines to reduce meat consumption by 50% by 2030. Unlike here in the UK, when the Chinese government makes an announcement the people will (usually) follow. So what has changed since then? I wanted to find out if there has been an impact 2 years on. I have limited training on the subject of China but I did live there for a couple of years in my early twenties and have not forgotten their seemingly loopy customs, the ones I mostly learnt were related to food which probably says more about me than the country. ‘Chinese food is the best in the world’ my mother told me before I left, laying the foundations for my trip, and I came away pretty much in agreement; one stone heavier; I ate all the dumplings! Why did I find it so hard to stop eating the dishes laid out on the restaurant table? Probably because they were utterly delicious, plentiful and never seemed to deplete. It would be an understatement to say I hate waste, anyone whose lived with me can attest the extremes I go to to avoid it, but in China it’s normal to leave mounds of food behind. I learnt a couple of theories around this: 1. They want to take special care of dinner guests 2. Food is used to display wealth. I was always shocked at the volume of food ordered, especially in relation to how much the hosts actually ate, maybe only a few mouthfuls. There is a common greeting in China that I was taught but never used ‘Chī le ma’ which is translated as ‘have you eaten?’. Its only appropriate between old acquaintances and would have been strange for a ‘laowai’; me, a ‘foreigner’ to use. It seemed a strange question and I was loathe to learn the antiquated response that came with it, I won’t bore you with the language part but you basically have two choices, either you have or you haven’t eaten. If you have eaten that’s great and the other person is happy for you but if you haven’t eaten then it gets complicated. If you haven’t eaten then you might be invited to their home for some food, sounds nice but don’t accept! You’re expected to turn down their invitation with a very specific answer, that you are just going to get some food. Phew, don’t get this wrong or you might end up in big trouble in little China. This dialogue (despite its formal, awkward but familiar ring to it, being a Brit as I am), made me wonder if there was a link to the great famine from 1959-1961; was it born as a result of peoples concern for one another’s wellbeing or did it predate this and was it as old as China when food was scarce everywhere. So, why did China, one of the Three Grand Cuisines of the world want to reign in meat consumption? Is it because they are eating as much meat as us? No, but are on track to eat as much meat as us in the future. Because they are such a massive country, with a population of 1.4bn, an increase in their meat consumption could be catastrophic to global greenhouse gas emissions. Currently emissions from livestock production is equal to the entire transport sector; about a quarter of global greenhouse gas emissions. Did I mention there are a lot of people in China? They consume more than a quarter, 28% of the worlds meat and half of the worlds pork. But back in the eighties they were consuming less than a quarter of that, a much healthier diet. China opened up to foreign business in 1978 and the Chinese diet started to change soon after that, meat consumption has been rising ever since. 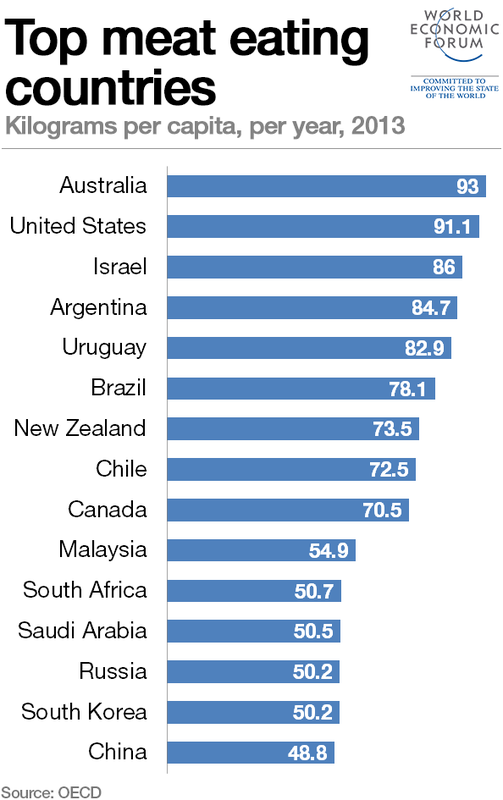 But, they are still not the largest consumer of meat per capita, that award goes to the US and Australia who consume nearly twice as much than the average Chinese person. So, have the new Government guidelines of 40-75g of meat per day (consumption in China is currently twice that) had any impact on meat consumption? Pork consumption has been falling in China since 2014 and continues to decline but this unfortunately cannot be linked with an overall reduction in meat consumption as fish, seafood, poultry and beef have all increased to fill that gap. It appears that people are eating less fatty meats like pork but replacing them with leaner cuts of fish, poultry and beef. Good for the waistline but not so good for the Governments objectives. China Agricultural University calculated that China wastes enough food to feed 200 million people per year, is this the result of all that overordering in restaurants and could this be contributing to the rising per capita meat consumption? Perhaps if China could address food waste they might find that meat consumption is not as high as it appears. ‘Operation Empty Plate’ was launched to encourage the wealthy to be less wasteful and saw 750 restaurants in Beijing sign up offering smaller portions and encouraging people to take home excess food. Even the Communist Party leader Xi Jinping endorsed the campaign giving it huge leverage. It is easy to think that China is the bad guy: their food waste could feed 200 million people per year, they consume half the worlds pork and a quarter of the worlds meat but you could argue that a country which went through a massive famine only 60 years ago and has spent the last 40 years growing and prospering is now merely catching up with the rest of the western world. They want to enjoy their newly found wealth. We will just have to hope that this emerging superpower and the people of China will continue to grow and prosper eating mostly tofu.